Boasting the largest tobacco-era baseball checklist of all-time, 1910 T210 Old Mill Baseball offers a detailed look at minor league players in the South. Although many of the players in the checklist are obscure, Joe Jackson and Casey Stengel are the clear favorites and very valuable. 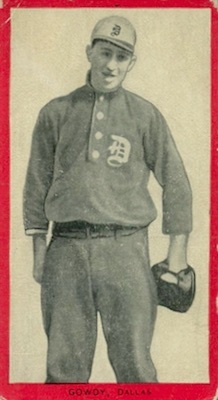 1910 T210 Old Mill Baseball were originally available in packs of Old Mill Cigarettes. Coming in at a whopping 640 cards, the extensive checklist covers a multitude of minor league teams. The product is broken down into eight groups or series. Each series covers a different league with the final three subsets available in the lowest quantities. Although many tobacco releases have a tendency to blend together due to similar sizing and design, 1910 T210 Old Mill Baseball cards immediately stand out from the rest due to a bright red border. This blast of color helps highlight the black-and-white images that populate the set. The sensitive red border is also one of the main reasons that high grades are tough to locate and command a premium. 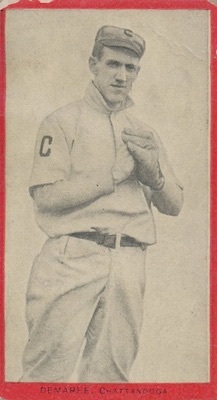 The last name and minor league team for each player is noted below the image, at the bottom of the card. 1910 T210 Old Mill Baseball card backs are simple and fairly similar across the entire release. 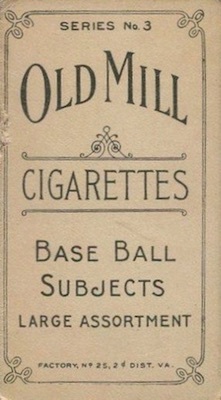 Each card back features an Old Mill Cigarettes logo and the tagline "Base Ball Subjects League Assortment." A basic border surrounds the information and the factory information is listed at the bottom. The backs also offer the easiest way to organize the set as the specific series is noted at the top of the card. The complete breakdown for 1910 T210 Old Mill Baseball follows with the specific league and card numbers for each series release. The final three series are believed to be the rarest. Despite featuring 640 cards, most of names in the 1910 T210 Old Mill Baseball would be unknown to even seasoned collectors. However, Shoeless Joe Jackson, one of the biggest names in vintage collecting, has a card in the Series 8 subset and is the top draw in the entire product. 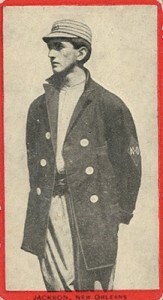 Jackson spent most of the 1910 season with the New Orleans Pelicans before he was called up to the majors for the Cleveland Naps in 1911. Even in low grade, the rare card fetches six-figures. Casey Stengel is another top option for collectors. The Hall of Fame skipper is best known for his time as the manager of the New York Yankees during the 1950s. 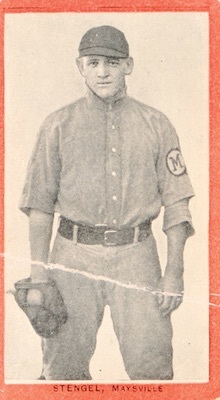 Before that, he was a solid MLB player and Stengel's T210 card showcases his minor league stint with the Maysville Rivermen in 1910. 640 cards. Shop for base cards on eBay. The cards are grouped by series and team and listed in alphabetical order. Notations are listed for players with multiple cards.